Honestly, I didn’t have great expectations for a Zero Calorie root beer. 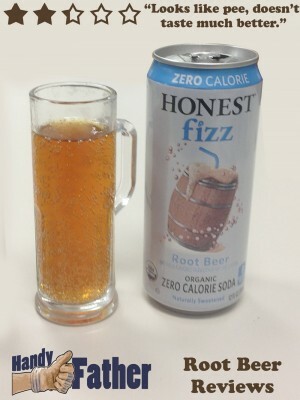 The Honest Fizz Root Beer Review lived up to the expectations with flying lack of color! Well, there was a color. The color was a match to the bodily fluid, urine. Honest Fizz Root Beer is nae undrinkable as a root beer. I suppose an argument can be made that you drink it for your health, but why bother with bad root beer? Just stick with water! Handy Father gives the Honest Fizz Root Beer Review a score of 2.25 out of 5 stars. It’s just not that good. If you need a zero calorie drink, don’t go this way. Go elsewhere. Don’t believe it’s no good? Don’t take out word for it! Give it a try yourself! Buy Honest Fizz Root Beer here.